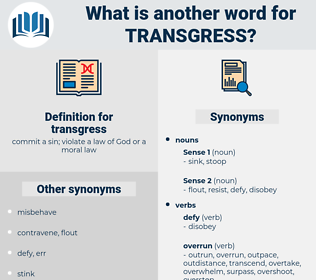 What is another word for transgress? fly in the face of the law. takes law in to own hands. mark, conform, secure, surrender, repent, justify, solder, heed, bind, listen, attend, serve, defer, regret, mend, weld, yield, forgive, attach, rue, notice, pardon, join, fasten, watch, unite, mind, submit, note, regard. 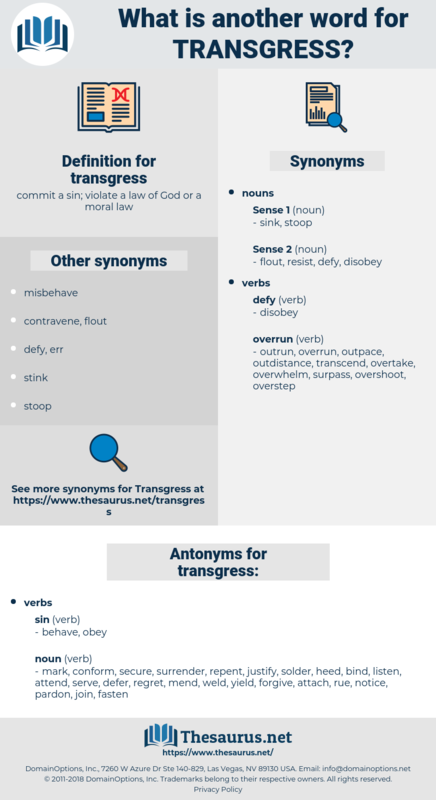 See that he does not do Glaucon a mischief, or transgress the rules. There are many in Egypt who will habitually transgress one of the fundamental orders of their faith, namely, never to pray when in a state of religious impurity.